Roger J. Cloutier passed away peacefully at home on January 27, 2019. He was 88 years old. Born July 25, 1930 in North Attleboro Massachusetts, Roger was the son of J. Donat Cloutier and Ludivique Precourt Cloutier and is survived by his wife of 64 years Linda McAuslan Cloutier. He was a veteran of the United States Navy and served as a Radarman 2nd Class aboard the Cruiser USS TOLEDO and the Destroyer USS Gainard during the Korean War. Arriving in Oak Ridge in 1959, Roger worked as a scientist and retired from Oak Ridge Associated Universities after 33 years. He directed programs in health physics, medical physics, and environmental sciences. He was also active in the national Health Physics Society and served as its president in the early 1980’s and later received the Founder’s Award in 2000. His professional contributions include helping create many health standards and practices within the field of radiation and nuclear science. 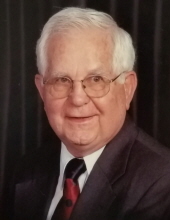 In the Oak Ridge Community, he served on several not-for-profit boards including Youth Haven, Clinch River Home Health and the Community Relations Committee. It’s difficult to appropriately pay tribute to Roger’s scientific achievements in part because he was so quiet about them. In addition to the Health Physics Society Founder’s Award, he was the recipient of the Loevinger- Berman Award given in recognition of excellence pertaining to the field of internal dosimetry; in 1996 the proceedings of the Sixth Annual International Radiopharmaceutical Symposium were dedicated to Roger and his protege Evelyn Watson “these two remarkable scientists and their contributions to internal dosimetry”. He delighted in exploring the mysteries of the universe, science and perhaps most especially, human behavior with anyone ready to share a cup of coffee and a few minutes. People fortunate enough to share these moments came away with a renewed sense of wonder and perhaps more questions than ever……which was always exactly Roger’s point: keep asking questions because you never know where they might lead. With a ready wit and ever-present twinkle in his eye he would probe, inquire, suggest, cajole, question and question again without ever belittling the beliefs of his companion. He was interested in everyone’s opinion no matter their background. Even during his final days he was quizzing his care givers on the engineering principles of the medical equipment he had around him. He spent a lifetime studying the world around us and along the way he embraced a statement by Copernicus, the scientist who stopped the Sun’s movement around the earth: “Most of our arrogance, including my own, is due to our ignorance. And most of our ignorance is due to the brevity of our life. We die when we have just begun to learn, and before we have had a chance to evaluate our own little contribution to the wisdom of the world”. Roger’s contributions were rich indeed and improved the lives of millions of people. A church service will be held at St. Mary’s Catholic Church in Oak Ridge, Tennessee on Saturday, February 2, 2019 at 10:00 am with family greeting visitors prior to the service. A Celebration of Life will be held at a later date. To send flowers or a remembrance gift to the family of Roger Joseph Cloutier, please visit our Tribute Store. Family will greet visitors prior to the service. Artists of Indian America Inc.
"Email Address" would like to share the life celebration of Roger Joseph Cloutier. Click on the "link" to go to share a favorite memory or leave a condolence message for the family.